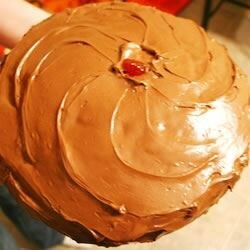 "This is a very good chocolate cake, when frosted with a chocolate frosting it is a double chocolate treat." Sift the flour, sugar, baking powder, soda, and salt together into a large bowl. Add the butter or margarine, milk, and vanilla to the dry ingredients in the bowl. Beat for 300 strokes, or for approximately 2 minutes at low speed with an electric mixer. Add the eggs, melted chocolate, and red food coloring to the batter. Beat an additional 300 strokes or 2 minutes at low speed. Pour into two greased and floured 8 inch layer pans. Bake at 375 degrees F (190 degrees C) for 30 to 35 minutes, or until done. This was a really good chocolate cake, very moist and delicious. My whole family loved it. Very easy to make and tasted great! Though I recommend going a little heavier on the chocolate if you're looking for that "decadent" chocolate flavor. I will use this recipe again. this cake is fantastic! I also added 1/2 a cup of cocoa powder and the flavor is amazing! Bravo!